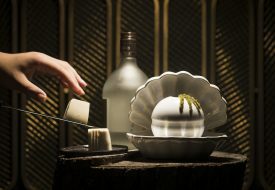 With our taste buds already titillated by the creative Singaporean districts-representing cocktails at the bar counterpart, we can only expect but good things from the main restaurant of Origin Grill. 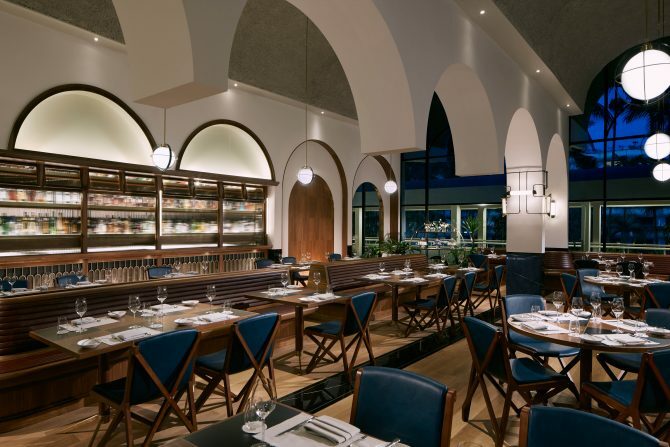 Located under the same fancy shmancy quarters of Shangri-La Hotel, Origin Grill, like the bar, continues to embrace the spirit of travel adventure, displayed fondly not only in the food, but also by the interior design that reminisces a travelling train. But railway express aside, the restaurant exudes a heavy amount of masculinity with hard-knock wooden fixtures and rustic panelled flooring under the uninformed eye. Thankfully, a youthful vigour managed to weasel its way in, giving the commanding semblance spurts of vitality with cyan-hued leather padded seating and clean curves arches at the ceilings. After the first sips of wine are taken, Origin Grill’s round of starters is promptly presented, kicking off the culinary journey the restaurant yearns to take you on. With a glass of Riesling as our passport, we visit Perth’s Frementle by chowing down on its slightly rubbery octopus tendril ($24), saved by a coating of sweet and sour tomato jam, before hurriedly voyaging to Japan’s Hokkaido where we inhale its prized scallops ($32) that are baptised in butter before pan-seared. 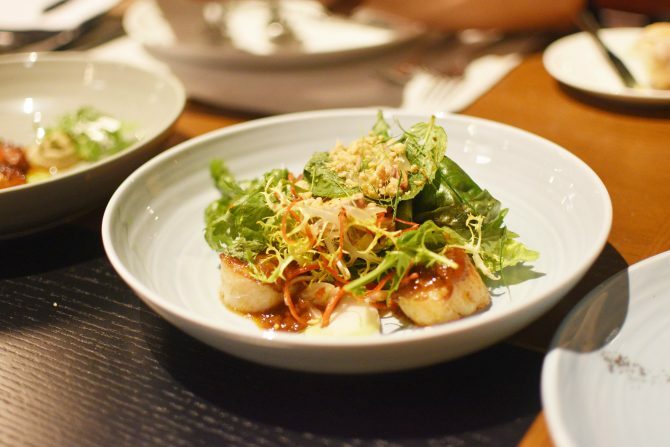 A side of Asian herb salad, featuring roasted peanuts and kaffir leaves lend a nice crunch to Japan’s oceanic treasures. The blossoming garden of raw tuna and other edible greenery ($26) offers a pretty visual for Instagram. You’ll find nature’s delicates of cucumber strips, onion slices, jalapeno ringlets and avocado puree laid on a seedy vegetable cracker. However, its bland and rather dry profile left us less than impressed. But of course, all eyes are on Origin Grill’s lineup of beefy offerings to quell one’s carnivorous cravings. After another gulp of wine (red, this time), we toss all table manners aside and tear through four of these meaty variants, where each glistening slab reflected its origins and cooking method exemplarily. The Snow-Aged Full Blood Wagyu Striploin A4 ($168) proves most intriguing with its uncommon ageing process. Invented in Niigata where snowfall is at its highest, yukimuro (snow ageing) is a process that utilises the surrounding snow as a natural refrigeration for the beef. 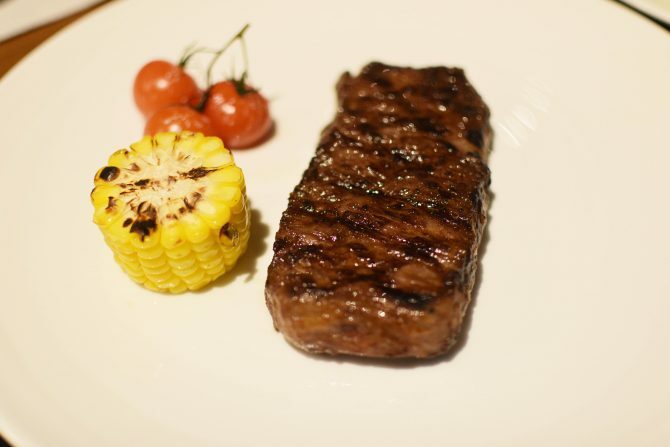 What is yielded is wagyu beef boasting high marbling content that gives an extremely tender, gloriously fatty texture. While the snow-aged wagyu easily satisfies with its melt-in-the-mouth profile, it tries but almost fails in delivering a distinct beefiness that some may yearn for. Thankfully, the Shiro Wagyu ($138, Striploin/$188, Ribeye) and the John Stone ($98, Striploin/$128, Ribeye) do the trick. Still giving good marbling content for that fattiness, the former provides a chewier, yet still tender, beefy taste, while the latter offers just a smidge less in that department. Furthermore, the John Stone still touts a nice charred exterior, giving the hunk of meat a quirk to stand out from the lot. However, if beefiness is all you want, then the grass-fed Williams River Cross Bred Wagyu Tenderloin (from $58) will certainly have you sorted. With bellies almost bursting at the seams, we almost make the cardinal sin of skipping desserts and eventually opt for the Brioche Donut and Coffee ice-cream ($16), filled with orange cream and sprinkled with nut crumble, and the Origin Yuzu Lemon Tart ($16), served with a strawberry iced lolly. 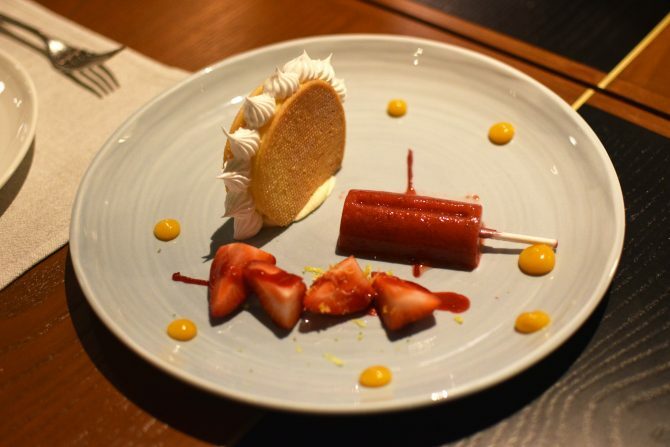 Thank goodness for the divine intervention that made us switch our minds as both desserts are crafted so perfectly for the typical Singaporean palate – not too sweet while still strong in flavours. The Chocolate Fudge Red Velvet ($14) also deserves a hallelujah chorus with its fudge cake makeup cloaked in a Valrhona Manjari chocolate ganache. 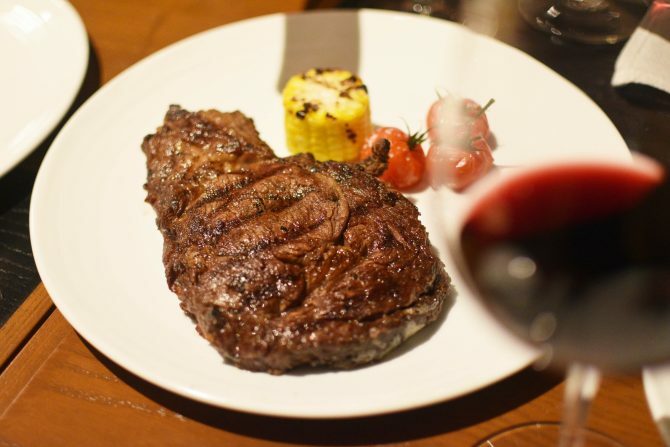 Now that’s what we call a full steakhouse experience.